Sleeping on a waterbed is a whole new experience. However, waterbed owners have complained that using the right kind of sheet on the waterbed is important. Waterbeds are made longer than regular mattress beds, so the sheets must be made longer also. Waterbed sheets have a unique design that helps them stay on. They have pockets sewn into the corners that wrap around and under the corners of the waterbed mattress. They also have flaps on the sides for tucking far underneath the mattress. Cut two pieces of fabric 74 inches by 86 inches. You can use cotton, or flannel for best results. 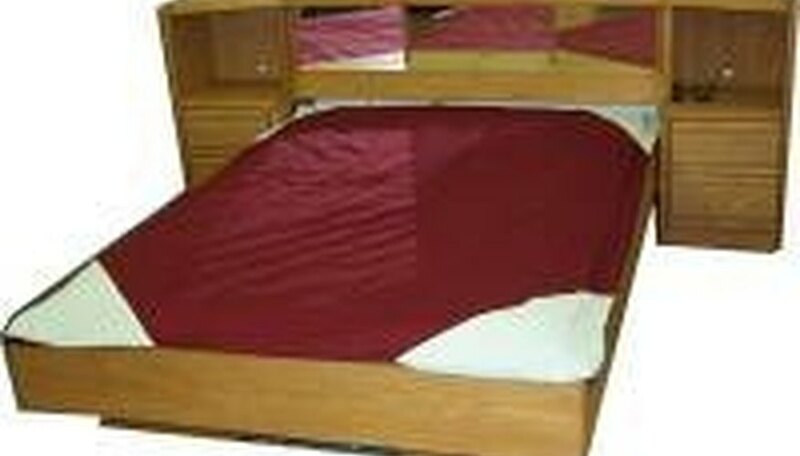 Waterbed sheets run 72 inches by 84 inches for king size beds, and 60 inches by 84 inches for queen size. The extra 2 inches is for a 1-inch hem on all four sides. Create a 1-inch hem on three sides of both fabric pieces by turning the fabric under and pinning it in place. Using a sewing machine stitch along the length of the hemlines. Remove the pins and iron the seams flat. Attach the top sheet to the bottom at the foot by sewing the pieces together. Lay the top sheet, right side up, on the floor. Lay the bottom sheet, also right side up, on the top sheet. Pin the unhemmed edges together. Sew a stitch across them both, 1 inch up. Swing the sheet on top around until it is on the bottom. Both sheets should be right side up. Iron the seam flat. Cut out four triangles from another piece of fabric 19-by-19-by-25. Hem each edge of the triangles 1/2-inch. Pull back the top sheet to expose the bottom sheet. Fold the top sheet in a manner so it is out of the way. Pin a triangle to each of the four corners of the bottom sheet. Sew them in place at the edges. Leave the tops of the triangles open. Measure the space on each side of the bottom sheet between the inside corners of the triangles. Cut two pieces of fabric the length of the measurement and 18 inches wide. Hem 1-inch on all four sides of both pieces of fabric. Pin one long side to the side of the bottom sheet and stitch. These flaps are used for tucking under the waterbed mattress to help hold the sheet in place. The corner pockets are used to tuck into the corners of the waterbed mattress. The longer the better. Make sure to measure your fabric properly. If the sides come up short then the sheet won't stay tucked in. Satin sheets are sometimes used for waterbeds, but because they slip and slide, it isn't advised.